Without much fanfare, the FDA recently transmitted to Congress a report it was required to prepare under the Food Allergen Labeling and Consumer Protection Act (FALCPA). This report demonstrates the food industry has taken responsible steps in recent years to avoid accidental contamination with allergens, and this has occurred largely in the absence of close federal oversight. The report also demonstrates this is a complex subject. A big unknown is the actual prevalence of serious allergic reactions triggered by allergens that are accidentally present in food. How often does a person open a packaged food, bite into it, and then experience an allergic reaction caused by an ingredient or residue unintentionally present? Ideally, we would have a good answer to this question so as to gauge the value of any regulatory response. FDA’s report does not present statistics in this area, acknowledges this is an unknown and states that consumer complaints and reported reactions likely underestimate the prevalence of unintended allergens in foods. In exploring the use of advisory labeling, such as “may contain peanuts,” the report presents a wide variety of statements currently in use. Clearly, there is no standardized terminology and no standard conditions that trigger the use of advisory labeling. In asking FDA to report on advisory labeling, Congress seemed to be concerned about the possibility that consumers who suffer from allergies might find these statements unhelpful. How exactly should a sensitive individual interpret “may contain peanuts?” Before deciding whether to eat the product, the person might want to know whether any accidentally present peanuts would be visible or how likely it is that peanuts could be present. In preparing its report, FDA surveyed a large group of consumers to get their thoughts on advisory statements. Respondents included a food-allergic group and a non-food-allergic group. Given four possibilities, both groups preferred wording such as Allergy Information: May Contain Peanuts. This was preferred over a much lengthier statement that attempted to provide more information: Produced in a facility with an allergy control plan. The possibility of contact with allergenic ingredients has been minimized. May still contain trace amounts of peanut. Despite being the most informative, this was actually the least preferred option. Perhaps it’s ambitious to expect consumers to read and then think about such a complex message on a food label. Significantly, FDA’s report does not question the value of advisory labeling in general. The report does not present strong conclusions or recommendations in general, but it tends to suggest that the problem of allergen contamination is best addressed through GMPs. FDA is already considering amendments to the food GMP regulations. It would be sensible to encourage steps such as identification and segregation of allergenic ingredients. When dedicated production lines are not available, validated cleaning procedures should be used to remove traces of allergens, and production runs should be scheduled in a way that minimizes the risk of contamination. These steps combined with sensible use of advisory labeling may represent a reasonable approach. Importantly, advisory labeling should not be used as a substitute for GMPs, and GMP recommendations must remain flexible so they can be tailored to fit a wide variety of food production operations. 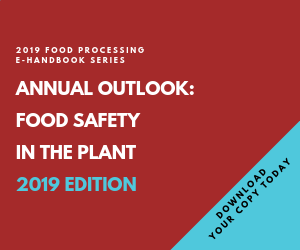 The report notes that larger food manufacturing facilities are generally more sophisticated in their procedures aimed at preventing allergen contamination. This will likely remain true. Any new GMP requirements obviously should not be so onerous that they drive smaller manufacturers out of business. It may remain true that a large percentage of food recalls are caused by the presence of undeclared allergens. These incidents are often labeling errors that occur when the wrong label is applied to a peanut-containing product, for example. This is a somewhat different and more dangerous problem than low-level, accidental contamination of a food with a stray allergen. This type of mistake seems to occur more often with smaller manufacturers, and it may be challenging for FDA to craft a regulatory solution. Happily, Congress refrained from mandating one-size-fits-all, allergen-control GMPs as part of FALCPA. If the food industry continues to show a serious awareness of the dangers of food allergens, FDA and Congress likely will continue with a measured and deliberative approach.